The vertebral column is divided up into sections by form and function. The top 7 vertebrae support the head. They are called the cervical (neck) vertebrae. 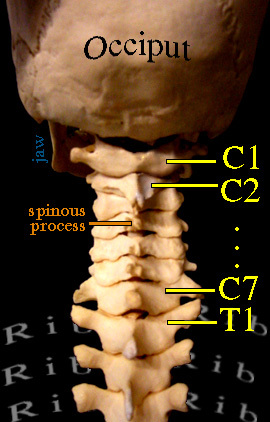 The topmost vertebra is C1 (or C-1, pronounced SEE ONE). The lowest is C7. Because of its unique role the top vertebra is also called Atlas (No, it doesn't have a map). Atlas is missing a bit of substance which is borrowed by C2 or Axis. C2 has an up pointing finger that acts as an axis for C1. Where O = odontoid (also calls the "dens") is an up pointing protrusion nestled within the ring of the Atlas. From the front looking up under the jaw (j) (alias mandible) we see from C1 down to C6. FM = Foramen Magnum (Big Hole) This is the entry portal for the spinal cord into the head. C1 is scooted back a bit to expose it. That also uncovers the joints (a) that sit on both sides of the foramen magnum which articulate with Atlas's shoulders. The front of Atlas (C1) is a skinny ring on the finger of Axis (C2). m = mastoid process, right behind the ear and where an important neck muscle attaches (the SCM or SternoCleidoMastoid). That's the one involved in torticollis (twisted neck). The disks (here in gray) are small in the cervical (neck) region. The cervical bodies have upward protrusions seen here which help stabilize. Although these have some rotatory capacity, at a glance we see that the big looking left and right rotation is going to come from the articulation at the skull (a) [which looks suited to flexing and extending as well] and from the unique C1 -C2 articulation. 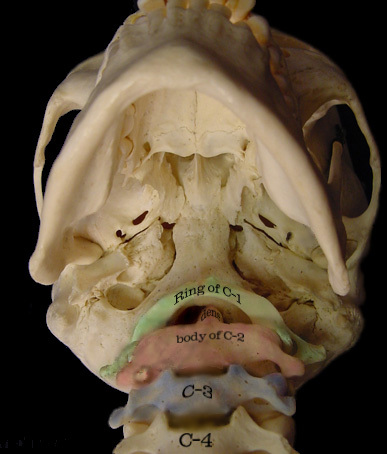 In the view at the right, the C1 has been put where it belongs and C2 is pulled a bit back to show the odontoid (or dens) and the thin ring-like anterior portion of the Atlas. The dens usually presses right up against the C1 ring with no space. It is constrained there by a seat belt of restraining ligaments. 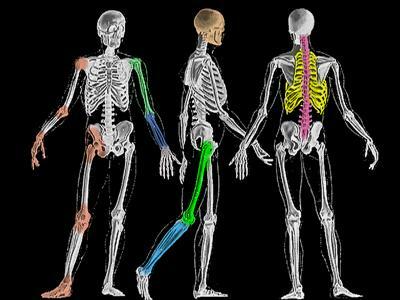 If those ligaments fail, then the relationship seen here can exist in reality. Note how that protrudes the dens into the foramen magnum territory. In Down Syndrome (trisomy 21 - extra 21st chromosome), about 12% have some degree of this. The ADI (Atlas Dens Interval) is seen to widen when the head is flexed (look at one's own chest). Seen from the top in this computer wire model, the dens, depicted in white, is nestled in its own area with a restraining ligament to contain it. 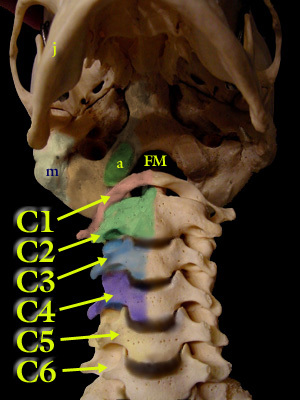 The yellow areas are the C1 articulations (joint surfaces) to hold the occipital condyles. Their shape allows horizontal rotation and flexion. The space behind the dens is called the Space Available to the Cord (SAC). If the SAC is reduced by dens displacement, then spinal cord compression may occur. 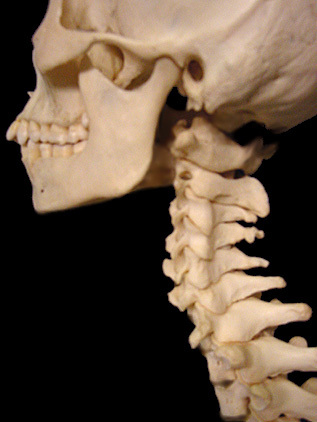 The upper facets of C1 sit on a pillar of bone which is shaped within the structure of the vertebra. The lower surface of this pillar is the articulation for C2. Cervical vertebrae stack one atop the other maintaining this pillar (arrows) which ultimately support the head. The dens (odontoid process) is more than a vertical axis. It is shaped as would be a tooth of a gear (actually, the other way around, God was first). That shape is called a catenary. That is the most effective shape for a rolling pushing motion force transfer. That shape suggests that the forward flexion of C1 on C2 behaves gear-like. The axis of that, based on shape, is within the fourth ventricle. Repetative flexion-extension then finds its stress point within fluid. Cool. The brachial plexus is a coming together of nerves that exit the lower cervical spine. Portions fuse and a bit further on behind the collar bone (clavicle) separate into different combinations of motor and sensory components from the original nerve roots. They reweave then again as they pass closer to the shoulder joint region. From this, three main peripheral nerves emerge, each with a bit of this and that from above. The three nerves are the ulnar, radial and median. The ulnar serves the inner aspect of the arm and the 4th and 5th fingers. The radial serves the back of the arm (triceps and wrist - finger extension). The median does the rest from the front (biceps, wrist and finger flexors). The ulna nerve does do a bit of overlapping function in the small hand muscles as well. From the back side the C1 embrace of the occiput is clearer. C2 has a very prominent spinous process (the shark's fin that sticks out backward on each vertebra). Note the transition at C7 and the chest area or Thorax. The thoracic vertebrae are numbered T1 to T12 - each with a pair of ribs. With ribs comes more prominent transverse processes (the pointer to T1 is sitting on a transverse process). Transverse processes articulate with ribs. The rib tip sits on the vertebral body and rests against the front tip of the transverse process. One pair (left and right) of ribs per thoracic level make 24 ribs or 12 pair. Ribs from T1 to T10 make it around to the front. 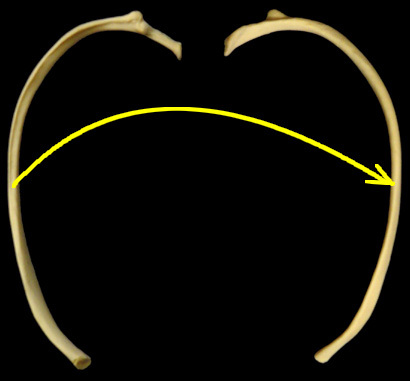 Of those, ribs T1 to T9 touch the breast bones (two parts). T10 ribs stop short and nestle up to the T9 ribs just at the spot where the rectus abdominus muscles (the 6 pack) attach to the lower front rib cage. That's a neat land mark. Where the rectus abdominus edge hits the ribs, that's the 9-10 rib boundary. Ribs 11 & 12 are short and are called floating ribs. This is one rib seen from the top and flipped to see it from bottom. The bump ^ sticking out is the articular thingy for the vertebral transverse process. At each level, the rib shape is contoured differently to define the shape of the chest. Ribs are NOT horizontal, but slant downward as you trace them forward. Bands of muscle attach ribs to one another. Those and other outer larger muscles raise and lower the ribs like the handle of a bucket. That is the bellows with which we breathe. A sheet of muscle that seals off the bottom of the chest cavity - the diaphragm - moves upward and downward to also expand the space in the chest cavity. That's a second breathing mechanism. <= This is cervical spine. <= This is thoracic. 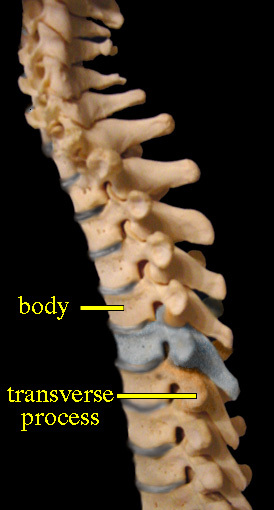 Even with the ribs removed, the transverse processes give away the thoracic vertebrae. The vertebral bodies of the thorax (and lumbar) areas do not have the strong forward overlapping bone seen in the neck. The disk structures are larger and contain more goo inside. The small hollow seen at the back of the disk is where the rib tip sits. The spinous processes slope downward much more. The joints and rib structures of the thoracic spine make it fairly rigid. Some, but not much movement happens in this zone. 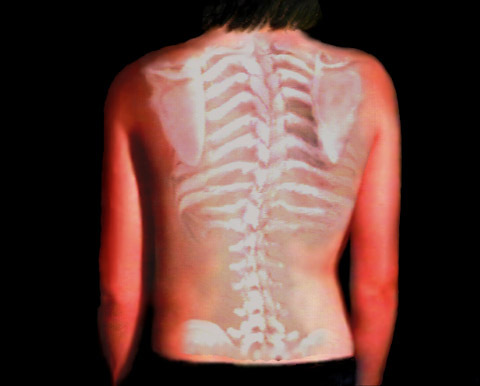 Side bending spinal deviations are called scoliosis. However, the rotation of the rib cage is very much a part of that process. This is covered in detail in the section on scoliosis. After the ribs (R) run out, we are in the Lumbar region. 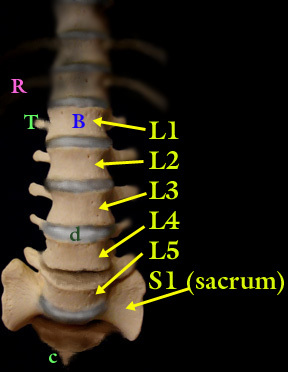 The lumbar vertebrae are numbered L1 to L5. Transverse processes are large despite there not being ribs. Here they are handles for very powerful muscles which help us do weird moves. A jockey falling off a horse can rip these off - the jockey's fracture. Vertebral bodies (B) are large and drum like. Disk structures (d) are even larger and protrude beyond the bodies giving the spine a scalloped profile. Below, ribs begin again. However, as with the sacral vertebrae, they are specialized and fused together. This zone of fused altered vertebrae and strange ribs forms the sacrum and pelvis. A few left over vertebrae trail off as the tail or coccyx bones.